Burrata is a member of the pasta filata (spun paste) cheese family, to which mozzarella also belongs. A fresh cheese made from a mix of both mozzarella and cream, it has fairly recent beginnings in 1920s Puglia, a region renowned for sheep farming and agriculture. The outside of the cheese consists of a pasta filata curd made from buffalo or cow's milk, and when cut open reveals a buttery, creamy panna (milk) containing soft, stringy pieces of mozzarella. Literally translated as ‘buttered’, burrata is traditionally sold wrapped within leaves of asphodel which also act as an indicator of the cheese’s freshness – the greener the better. 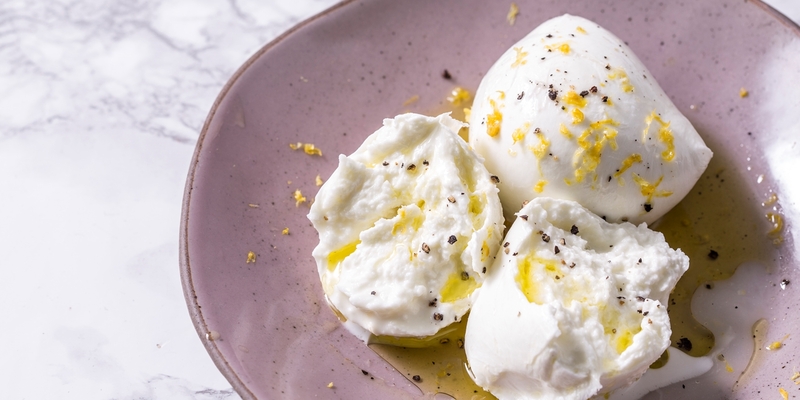 Whether encased within a pasta parcel or adorning a seafood starter, this collection of burrata recipes highlights its fantastic versatility as an ingredient. Alessandro Gavagna uses a combination of burrata and mint to create a beautifully fresh filling for his Agnolotti pasta dish. Salvatore Elefante, on the other hand, uses its distinctive creaminess to offset the tartness of tomato in his Tagliolini with tuna, aubergine cream and burrata recipe. Swapping pasta for pastry, Teresa Buongiorno wraps burrata in Kataifi pastry in her vibrant burrata starter recipe. The subtle flavours of burrata also pair beautifully with seafood, as exemplified in Gaetano Trovato’s scallop recipe and the Cerea Brothers’ Red prawns, tomato and basil seafood starter.